January 14, 11:00 a.m. – 8:00 p.m.
January 15, 11:00 a.m. – 5:00 p.m.
Come ready for good eats at the 12th Annual Florida Keys Seafood Festival, sponsored by the Florida Keys Commercial Fishermen’s Association. The event, which has plenty of excellent local seafood to go around, celebrates the fishing community and provides scholarships to college bound children of commercial fishermen. Stop by for the sanctuary booth and other activities, including live music, local arts and crafts, and kid's games. For more information, visit Florida Keys Seafood Festival. Registration is required to attend this six-week Florida Keys Community College (FKCC) course hosted by the sanctuary. Corey Malcom, Director of Archaeology at the Mel Fisher Maritime Heritage Museum, will talk about historic wrecks of the Keys. To register for the course, contact the FKCC Community Education Department at 305-809-3185 and cite course number 21120. Tuition fee is $19 for all six sessions. January 21, 10:00 a.m. - 11:00 a.m. Kids in kindergarten through fifth grade are invited to join the free, fun-filled Discovery Saturday at the Florida Keys Eco-Discovery Center. Discovery Saturday is held the third Saturday of every month. For more information, call 305-809-4750. Sanctuary Seminar: Yesterday’s WWII Vessels: Today’s Pollution? Registration is required to attend this six-week Florida Keys Community College (FKCC) course hosted by the sanctuary. Lisa Symons, Acting Deputy Superintendent FKNMS, will discuss how historic wrecks may still pose pollution hazards today. 9:30 .a.m. - 3:30 p.m. This working group of the Florida Keys National Marine Sanctuary Advisory Council is working to develop a voluntary education and recognition program for charter fishing operators. Registration is required to attend this six-week Florida Keys Community College (FKCC) course hosted by the sanctuary. James Fourqurean, Marine Ecologist at Florida International University, will talk about plans to outplant nursery-grown corals in the Key West area. This working group of the Florida Keys National Marine Sanctuary Advisory Council is working to develop a voluntary education and recognition program for charter fishing operators. Public attendance is encouraged. Registration is required to attend this six-week Florida Keys Community College (FKCC) course hosted by the sanctuary. Adam Emerick, a wildlife biologist with the US Fish & Wildlife Service's Florida Keys Refuge Complex, will describe the wildlife of the Keys and provide an update on the status of the refuge. Registration is required to attend this six-week Florida Keys Community College (FKCC) course hosted by the sanctuary. Dave Vaughn, Executive Director of Mote Tropical Research Laboratory, will talk about plans to outplant nursery-grown corals in the Key West area. February 18, 10:00 a.m. - 11:00 a.m.
February 18, 10:00 a.m. - 12:00 a.m.
A free introduction to Chart Plotting Seminar will be offered by the Key West Sail and Power Squadron. Attendees will learn to plot course direction, measure distances, and plan routes on local charts. All members of the public are welcome, with no charge for admission or class materials. To help the Squadron plan, please send an email to dickieo659@gmail.com that you will attend. Draft meeting agenda (including start time) will be posted on the Sanctuary Advisory Council Meetings and Announcements webpage. Registration is required to attend this six-week Florida Keys Community College (FKCC) course hosted by the sanctuary. Stephen Werndli, Enforcement & Response Coordinator for FKNMS, will explain efforts to restore seagrass and coral habitats following vessel groundings. February 25 - 26, 8:00 a.m. - 11:00 a.m. The Gigantic Nautical Flea Market is a super place to get great bargains on boating fishing, diving, and nautical themed gear. The event raises money for college scholarships for Upper Keys youth. For up to the minute information, please see the Rotary Facebook page or email giganticnauticalmarket@gmail.com. The US Coast Guard Auxiliary Flotilla 13-03 is offering a Boating Skills and Seamanship class. Topics include nautical highway signs, rules of the road, navigation, course charting, boat handling, equipment, radio procedures and other safe boating skills. This is an approved boating safety program which qualifies students, successfully completing the course, to receive the Florida Boating Safety Education ID card. The cost of the program is $55 per person (materials included) or $80 for two people with shared materials. For more information, visit Flotilla 13-03's Web Site and select “Boating Safety Classes.” Or, contact Diane Adam at auxclassreg@yahoo.com or 305-872-4071. The Key West Sail and Power Squadron is offering the ”America’s Boating Course". The introductory course covers boat handling, elementary seamanship, navigation aids, weather, marine radios, Florida boating regulations and more. Completion satisfies the mandatory Florida State boating certification requirements, allowing attendees to receive their Florida State Boater’s ID card. The Boater ID card is required for anyone born after January 1st, 1988 to operate a boat of 10 horse power or more. The course fee is $60.00 and covers the cost of the material. Additional family members willing to share materials can enroll for $15.00. For information, call Vince Melendy at . More information and registration is posted at www.usps.org/keywest. March 9, 6:00 p.m. - 9:00 p.m. 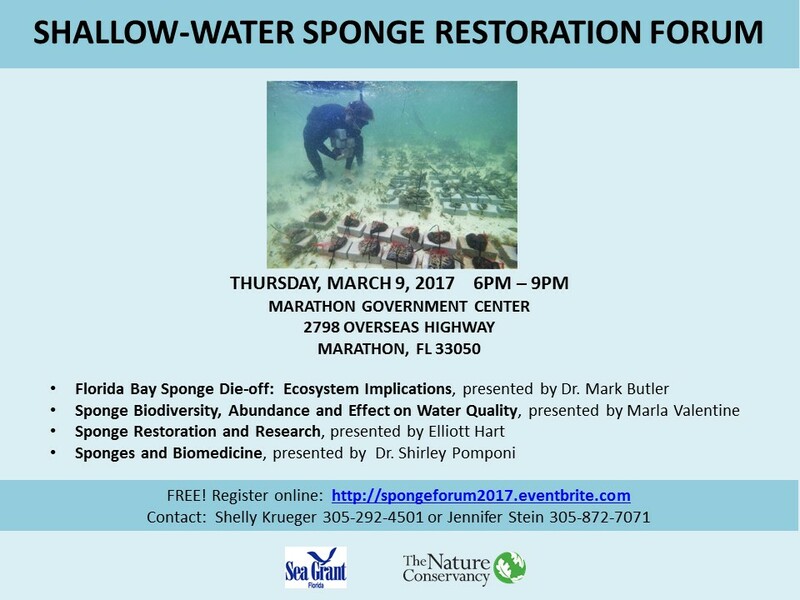 Registration is FREE, please RSVP at spongeforum2017.eventbrite.com. March 18, 10:00 a.m. - 11:00 a.m.
Sunday, ​April 2, 8:00 a.m. – 12:00 p.m.
April 15, 10:00 a.m. - 11:00 a.m. Draft meeting agenda is also posted on the Sanctuary Advisory Council Meetings and Announcements webpage. The sanctuary will conduct training sessions for Team OCEAN volunteers. Participants must clear a background check prior to participation in boating activity. For more information on becoming a volunteer and participating in Team OCEAN activities, contact Nicole.Uibel@noaa.gov or Eric.Raslich@noaa.gov. May 20, 10:00 a.m. - 11:00 a.m. The Spring Heritage Awareness Diving Seminar will focus on providing Course Directors, Instructor Trainers, and Instructors with a greater knowledge of how to proactively protect shipwrecks, artificial reefs, and other underwater cultural sites. The three-day seminar will include two evenings of classroom-based learning and one day on in-field dive training that provides direct experience relating to classroom discussions. Cost is $150 and includes all course materials and charter boat fees. For more information or to reserve your spot, contact Nicole Grinnan, Florida Public Archaeology Network, Northeast Region, by email at ngrinnan@uwf.edu or call 850-595-0050. June 17, 10:00 a.m. - 11:00 a.m.
July 15, 10:00 a.m. - 11:00 a.m. The two-day Sport Season for the Florida Spiny Lobster is governed by slightly different rules than the regular season. A valid Florida recreational saltwater fishing license and a lobster permit are required to harvest spiny lobster. See the 2017 Regulations for Recreational Harvest for more information. August 19, 10:00 a.m. - 11:00 a.m.
September 16, 10:00 a.m. - 11:00 a.m.
October 21, 10:00 a.m. - 11:00 a.m.
November 18, 10:00 a.m. - 11:00 a.m. Kids in kindergarten through fifth grade are invited to join the free, fun-filled Discovery Saturday at the Florida Keys Eco-Discovery Center. Discovery Saturday is held the third Saturday of every month. For more information, call 305-809-4750. December 16, 10:00 a.m. - 11:00 a.m.